The Fed seems to be on a "suicide mission," raising rates while the government deficit increases as a share of GDP, says the founder and chief executive officer of DoubleLine, which manages $120 billion. "It certainly looks like the U.S. is going to break down to me and to a lower level," he says about the stock market. "Corporate bonds remain very overvalued, ... corporate bonds should be avoided," Gundlach says in a webcast. 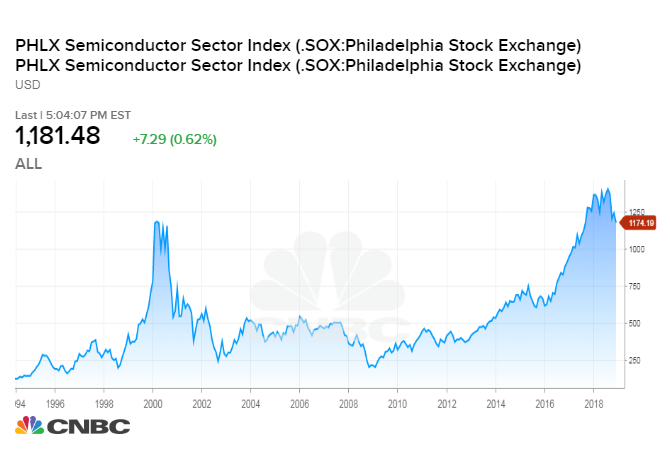 Gundlach used charts to tell his bearish story, showing a chart of chip stocks going back to 2000 and how they were unable to stay above their highs made during the dot-com bubble. He did the same with financials, showing bank stocks have failed to break out after rising close to highs last seen just before the financial crisis. Gundlach noted that banks won't perform even if rates are rising if the yield curve is flattening. And he noted that higher rates have hurt loan growth, which will in turn hurt financial profits. "It's difficult when demand for your product is dropping," he said. The investor also took note of the recent drop in the "FAANG" stocks (Facebook, Amazon, Apple, Netflix, Google-parent Alphabet). 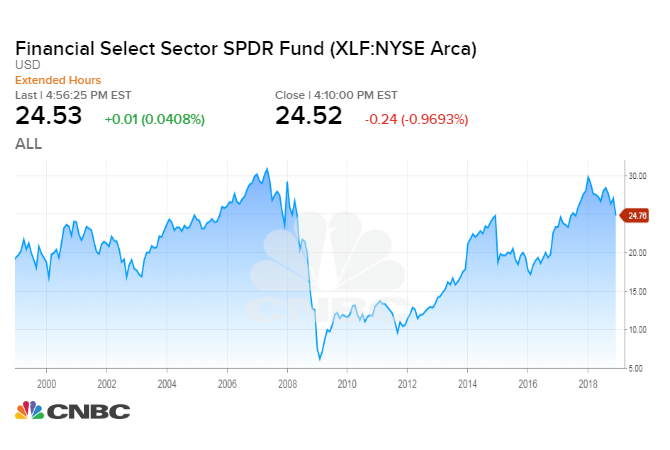 "You've got all these now in a bear market," said Gundlach, whose firm manages $120 billion. 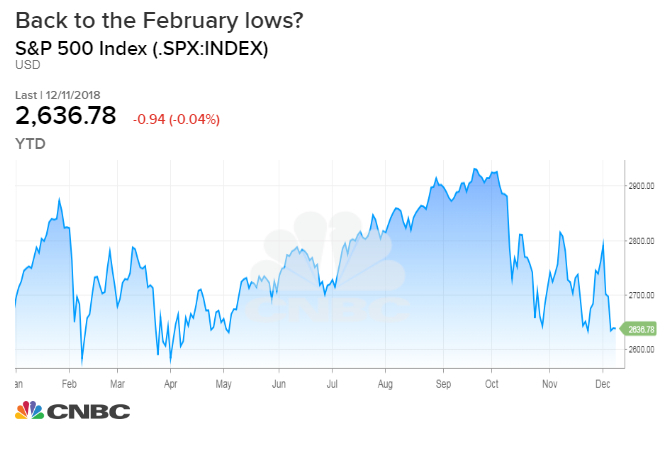 The S&P 500 is down 1 percent for 2018 after a 10 percent drop this quarter. Gundlach noted that the shrinking of the Fed's balance sheet this year correlates with the rollover in stocks. On interest rates, Gunldach has the view that they may continue to rise even if the economy is weakening because of increased supply from the government trying to fund an increasing deficit. He proposes that the economy is slowing "and maybe the supply makes it so rates don't go down with economic weakness." The Fed seems to be on a "suicide mission," raising rates while the government deficit increases as a share of GDP, Gundlach said. Normally when the deficit is expanding, the Fed would be lowering interest rates. The Federal Reserve is widely expected to raise rates on Dec. 19, despite the recent market volatility. That would be the central bank's fourth rate increase this year. "Corporate bonds remain very overvalued; ... corporate bonds should be avoided," he added, citing the slowing economy and rising credit risks. On currencies, Gundlach said, "I still believe pretty deeply that the next big move in the dollar is down." He cited those same deficit concerns. But he does like one play for the long term: emerging markets. "I think you''ll do much better" owning stocks outside of the U.S., Gundlach said, citing his weak dollar forecast.